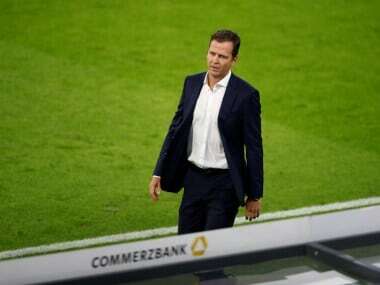 Dortmund: Injured Manuel Neuer was named in Germany's extended 27-man World Cup squad on Tuesday, but there was no place for Brazil 2014 winner Mario Goetze. 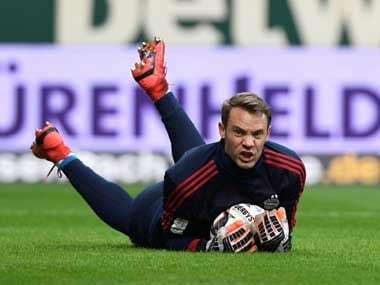 Neuer, Germany's captain and goalkeeper, has not played since September and still has to prove his fitness at a fortnight-long training camp in northern Italy, which starts next week. The 32-year-old Bayern Munich star is one of four goalkeepers named by head coach Joachim Loew, who will have to cut four names when the final 23-man squad is submitted for the World Cup finals, which start on June 14 in Russia. "Manuel is getting back into full training this week at Bayern Munich, that assures us that he can tolerate the full load in the training camp," explained Loew. "Then we want to get a full idea, talk to him frankly and honestly, asking 'is it possible to play at the World Cup?'" There is no place in Loew's squad for Goetze, who scored the winning goal in the 2014 World Cup finals, after an erratic season at Borussia Dortmund. However, Loew pulled a surprise by handing a first call-up to Freiburg striker Nils Petersen, 29, the top-scoring German in the Bundesliga this season with 15 goals. Yet there is no place for striker Sandro Wagner, Robert Lewandowski's back-up at Bayern Munich, who helped Germany win the Conferderations Cup in Russia last year. Loew has also selected Mesut Ozil and Ilkay Gundogan despite the pair landing in hot water with the German FA over the weekend after the Premier League stars posed for pictures with Turkey President Recep Tayyip Erdogan. Ozil is in the squad despite suffering from a back injury while Bayern Munich defender Jerome Boateng has also been called up even though he is currently sidelined by a groin injury. Germany open their Russia 2018 campaign against Mexico in Moscow on June 17, the defending champions also facing South Korea and Sweden in Group F.